Hi, I have attempted to link the faceware video to the maya rig 3-4 times, and every time I get an error that the Video file is invalid. Anyone know why? Hi, I should have explained better. I created a video on faceware as per the class. Then opened maya and rigged up the model using Retargeter. I create and save the .xml file. I find the Performance file, and choose the options Import Video and set playback range. When I click on OK, I see this and error that the Video xml file was invalid. I have tried this multiple times and Idk what I'm doing wrong. When I tried to make the video file, Analyzer said that my webcam wasn't supported. Because I could record a video anyway, I just tried it and it worked. Maybe it's your camera? Or maybe your settings for recording the video? Just guessing here. 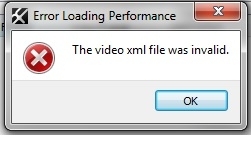 The error for an invalid video xml file is typically caused when there are extra files in the performance folder (the folder that is created when you open the .fwr for the first time). Can you please make sure that there are only the files from the .fwr in that folder and that no other files or folders have been added? Regarding the Capture feature, please note that the video is expected to be black (as noted in our knowledge base article: http://support.facewaretech.com/capturing-a-new-performance) during the capture process. This is because the Capture feature is software capture and leaving the area black reduces the overall resources needed which helps to preserve the desired frame rate of the capture. You won't see anything in that area until you click Review/Trim Captures to look at what you've captured. Is this what you're seeing or are you completely unable to capture at all? Also be sure to check that your camera is selected in the Edit > Video Source menu in the Capture dialog.